I adored "My Friend (Swag's Good Buddy Remix)" at time of release, but had somehow downrated it as "dated" when both the compressed electrokid sound and the dark glitchy minimal techno sound took over a few years after. Big mistake. Once the slightly cheesy "balearic" effect evaporates, it's a heartbreaking majestic dubby offbeat sunshine house moment that you could totally picture Jef K playing after hours of sensual floor building. Proper deep house here. While the original _My Friend_ is a perfectly pleasant piece of downtempo, Dorfmeister and Madrid de los Austrias give it a nice house spin with copious amounts of funk and just a hint of disco. But Swag offer up a more spacey mix with some breaks as a rhythmic backdrop. Though slower than the Dorfmeister vs. Madrid de los Austrias, it is the more satisfying mix. With friends like these, who needs additional remixers? This is a fantastic record, all the mixes add something new to the track. The original is perfect for a post-club party, or a summer afternoon. Both the Rabbit in the Moon mix, and Kruder and Dorfmeister are excellent, but my favourite has to be the DJ Icey mix, he makes some of the best US breaks tunes around, and although some could say some of his stuff is a touch cheesy, its his style and it works. 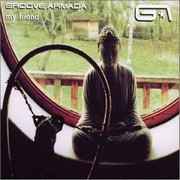 Groove Armada make great music and long may it continue.